New iMac and MacBook Pro with Force Touch landing this Wednesday? The 13-inch Macbook Pro, new for 2015. Thinking of picking up a new Apple computer this week? You might want to hang fire until Wednesday, because rumours are swirling that a product refresh is imminent, specifically for the 15-inch MacBook Pro and the 27-inch iMac. 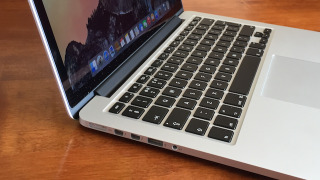 Speculation about the MacBook Pro makes sense - the 13-incher was upgraded earlier this year with Broadwell processors and Force Touch trackpads. As on the Apple Watch, Force Touch technology brings tactile feedback and can measure pressure. It's also present on the new MacBook unveiled in March. MacGeneration spoke to some reliable sources who say the 15-inch model is about to get the same upgrades the 13-inch one already has. The French site has a good track record as far as rumours go but apart from that we don't know much about additional specs or availability. We know even less about the 27-inch iMac upgrade - it could be a refresh of the ultra-expensive 5K model or the more modest non-Retina edition. According to MacGeneration, an upgrade of some description is in the pipeline and will also arrive on Wednesday. As spotted by AppleInsider and others, non-standard configurations of the 15-inch MacBook Pro are starting to be pulled from the Apple Store. It was assumed this was ahead of new launches at WWDC in June, but it looks like those launches will happen sooner rather than later. We were unable to glean much from a quick call to the Apple Store, so presumably sales staff have been told to keep their lips sealed on any new launches - our friendly Apple expert did push the 13-inch model slightly more, but that's understandable given its newer hardware.